If you want to have an imposing, thriving garden that showcases your home to everyone who visits it, or even takes a glance at it, you must set the proper foundation first, and that foundation is soil. There are many ways to enrich and prepare the soil so it is sufficiently fertile for long growing seasons of all kinds of plants, but it doesn’t take long to figure out that everyone already engages in composting, just in the most disorganized, wasteful, and dismissive manner possible. When we say ‘compost’, we mean any organic matter that has been sufficiently decomposed and recycled to serve as a valuable soil fertilizer. The modern way of dispensing with trash has largely improved our lives, by improving sanitation and preventing diseases and ghastly odors from wafting everywhere. However, we have to admit that we have gone somewhat overboard, even to the point of causing harm to the environment. For example, when you discard biodegradable matter into trash bins within enclosed plastic trash bags, which are then taken to landfills, you are creating an anaerobic decomposition process which produces methane. In turn, methane has a considerable impact on our climate – landfill waste alone is held responsible for about one fifth of all domestic methane pollution. The methane emission is also used as one of the primary reasons why we should not have such a giant meat industry, which is entirely unsustainable compared to receiving protein from smart planting of protein-packed plants. Not to mention the horrendous moral quandary inherently tied to the meat industry. You are contributing to unnecessary pollution and unnatural climate disruption. You are depriving yourself of the opportunity to create free fertilizer for your garden. Everyone knows that humans, like all animals, are creatures of habit. Far more so than of reason itself. So we must take extra effort to incentivize and showcase the benefits of something. When any work pops up as a potential DIY – Do It Yourself – people recoil, which is completely natural. After all, who would want more work put on their shoulders, isn’t life strenuous enough as it is? Why disrupt the already running system, with all its flaws? These are the questions that automatically pop up when you suggest a change in how things are done. However, when you broach the subject of composting, you very quickly come to the realization that it doesn’t require much work at all. Indoor composting in particular just requires a few tweaks of your entrenched habits in order to produce a high-quality fertilizer on a regular basis. Which can then serve for growing a food-producing garden, or just an ornamental one that attracts hummingbirds, bees, and butterflies. In fact, once you get the hang of composting, you will regret not engaging in it all along! Fruit, fallen from trees, overripe and unsightly. Bits of used tissue and cotton in your bathroom bin. All the extra food matter that you discard during food preparation, cooking, and after meals: banana peels, lettuce leftovers, garlic and onion skins, vegetable remains, eggshells, orange and lemon peels, etc., etc. Spoiled wine, spices, and herbs. Vacuumed dust, as it contains a lot of flaked skin. In short, if something is easily spoilable it is fit to serve as compost. That is the gist of it when we say “organic matter”. Paper products that are new and unused – along with colored newspapers, paper bags, catalogues, receipts, cardboard egg cartons, toilet rolls, etc. Clothing, strings, and twine made out of natural materials like cotton, silk, wool, bamboo, linen. Hard byproducts of plants and trees like pine cones, needles, twigs, saw dust, nut shells, wood chips, corn cobs. Pits from various fruits like mangos, watermelons, peaches, avocados, plums, grapes, etc. You get the general idea – the harder it is, the more difficult and time-consuming will decomposing be. Droppings from pets, and animal products like bones, meat leftovers, butter, milk, and fish skins. Blackberry and raspberry brambles, along with large twigs or branches. For both indoor and outdoor composting, choosing the right container for all that discarded organic matter is key. Fortunately, you don’t have to improvise here as there are now specialized composting bins available in many online and offline stores. You only have to pick the size that will be right for you. 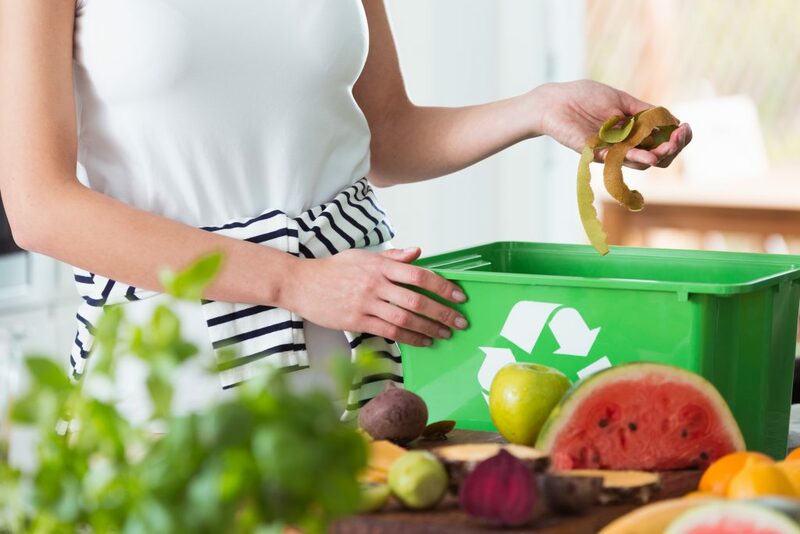 The compost bins from recycled plastic are the best, as they are sturdy, resistant to decomposing processes, and by buying products from recycled plastic you incentivize manufacturers to recycle plastic. And the more they do that, the less plastic waste we will find in oceans and forests. Stainless steel is another good choice. But first, you must decide if you want to engage in indoor composting or outdoor composting. Indoor composting is different in a major way, as it doesn’t rely on the outside environment to take care of the composting. Instead, you must create that compost-conducive environment yourself. But fear not, it is easy to do. Indoor composting is ideal for people who live in apartments, but still have enough space for mini gardens on the balcony, or have numerous potted plants. The most efficient form of composting in such situations would be – vermicomposting. You guessed it, it requires worms, but not just any worm will do the job. If you remember your lessons in biology from elementary school, worms function as nature’s recyclers. Regular garden earthworms perform that function admirably, but the burrow into the soil. On the other hand, the red wiggler worms – Eisenia foetida – habituate near or on the soil surface, making them perfect candidates for living in an enclosed compost bin ecosystem. According to a botanist expert Luke Halligan, from the Brooklyn Botanic Garden, red wigglers will eat half their weight in food per day. And as they dutifully devour all the organic waste, they will produce their own waste – a fine, granular matter that, in addition to decomposing organic matter, will serve as a superb fertilizer for your garden or potted plants. It holds a much greater variety of beneficial microbes, which will direct affect your plants’ resistance to fungal diseases. It provides for a significant increase in nutrients, which will make your plants grow stronger and faster. If you are growing food-producing plants you will have more bountiful harvests. It makes plants more resistant to attacks from mealybugs, spider mites, aphids, and other plant pests. When you are selecting the right compost bin for vermicomposting in particular, make sure that it is suited for it. Find the one that has a perforated top lid and the bottom, so it is well ventilated for the worms to perform their function. Then, you place the bin on a tray with something to elevate it, like wooden blocks, in order for the perforated bottom to have room for airing. You can place all of that on an additional tray for any liquid buildup that may occur. Wring the paper strips until they don’t ooze water. Crumble the paper strips and evenly place them in the vermicomposting bin, for up to two-thirds of the bin’s capacity. On top of the wet paper strips, add a light coating of garden topsoil. This will introduce microorganisms that will accelerate the worms’ digestive processes. Add finally, add the red wiggler worms themselves. Now, you just go along with your daily business, and whenever you have food to throw into the trash, you just discard it into the vermicomposting bin. Cooked food rich in oils, spices, and sauces. Large quantities of acidic fruit discards like lemon peels, as their bedding may develop too acidic. Indoor composting doesn’t necessarily have to involve vermicomposting, although it does produce the best soil for the plants. If you find the very idea icky, you can engage in both outdoor and indoor composting in a traditional manner, without any beneficial worms involved. With indoor composting, all that is required is proper layering of the biodegradable matter, which will determine the rate at which it is dissolved. With no worms involved, you don’t have to worry so much about ventilation, so you would have a wider choice of enclosed compost bins. Layer of foods and other organic material that you would otherwise discard. On the other hand, outdoor composting leaves you with having much larger compost bins, and the top can be perforated, as the generated decomposing odors would then not pose an issue. A good compost is a balanced combination of carbon and nitrogen. You can easily spot the difference, as something that is more ‘green’ will produce more nitrogen, while something that is more ‘brown’ will produce more carbon. A good compost will exude a rich, hot, slightly sweet smell. A bad compost will exude a putrid smell, which indicates too much nitrogen production. Easily fixed by adding more brown items, and mixing the pile. A stagnating compost will lack any distinct smell, which can be fixed by damping the pile with water and including more green items. – The tumbler design makes it effortless to churn the compost pile, without getting your hands dirty or using any tools. – All that is required to mix your compost pile is turning it a couple of times every few days. And if placed in a sunny spot, you can expect a highly accelerated decomposing process, finishing up in mere 2 weeks. – Made from recycled polypropylene, it is sturdy and resistant to all weather conditions, and most importantly – the decomposition processes inside it. – The tumbler design also makes for an excellent aeration system, so you can always tell if your compost is turning right and adjust accordingly and easily. If you are engaging in indoor composting that is not vermicomposting, then choosing the right composter bin will be the deciding factor if you succeed or give up half way through. Airtight lid working in unison with a changeable charcoal filter. This will allow you to have superior control of odors and a wide selection of places you can place the composter. Stainless steel will last you a life-time. Due to its elegant design it can be easily mistaken for an expensive trash bin. The 1.3 gallon size will be sufficient for creating enough fertilizer for an entire terrace filled with gorgeous and healthy plants.